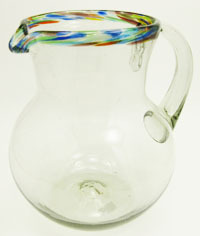 These swirl-rimmed pitchers are the perfect companion for the whirled set of 4 Margarita glasses Item ID:G4667-SET/4. They are beautiful, and hold a generous batch of Margaritas for a crowd. I purchased two pitchers and 3 sets of glasses for a party and we were extremely happy with everything. Will enjoy my glassware for many years to come.